Blame economic worries, another freezing winter, or the cascade of scandals emerging from the world’s leading climate-research body, the Intergovernmental Panel on Climate Change (IPCC). But concern over global warming has cooled down dramatically. In über-green Germany, only 42 percent of citizens worry about global warming now, down from 62 percent in 2006. In Britain, just 26 percent believe climate change is man-made, down from 41 percent as recently as November 2009. And Americans rank global warming dead last in a list of 21 problems that concern them, according to a January Pew poll. This is no dispute between objective scientists and crazed flat-earthers. The lines cut through the profession itself. Very few scientists dispute a link between man-made CO2 and global warming. Where it gets fuzzy is the extent and time frame of the effect. One crucial point of contention is climate “sensitivity”—the mathematical formula that translates changes in CO2 production to changes in temperature. In addition, scientists are not sure how to explain a slowdown in the rise of global temperatures that began about a decade ago. The backlash against climate science is also about the way in which leading scientists allied themselves with politicians and activists to promote their cause. Some of the IPCC’s most-quoted data and recommendations were taken straight out of unchecked activist brochures, newspaper articles, and corporate reports—including claims of plummeting crop yields in Africa and the rising costs of warming-related natural disasters, both of which have been refuted by academic studies. Just as damaging, many climate scientists have responded to critiques by questioning the integrity of their critics, rather than by supplying data and reasoned arguments. When you are losing an argument on the basis of facts and evidence, the oldest trick in the world is to invent some outrageous lie, the more outrageous the better, and while people are reacting to the lie, attention is diverted from the real issue. It is a sure sign of desperation in distracting attention from facts and data. The outrageous charge of fraud made by a self professed "photographer and truffle grower" (Gareth Renowden) is not worthy of response, but because the charge is so easily refuted, I will do so. According to Mr. Renowden (the "truffle grower), "Looking through Easterbrook's slides, it seems he has taken a graph of Holocene temperature variations prepared by Global Warming Art (used at Wikipedia), and altered it to fraudulently bolster his case. ... Easterbrook has quite deliberately altered the graph to reduce "current temperatures" by 0.75ºC and make the curve fit his storyline. The data in my paper comes from oxygen isotope analyses of ice cores in Greenland made by Dr. Minze Stuiver and Dr. Peter Grootes, long recognized as the world standard for accurate paleotemperatures over thousands of years and used by thousands of scientists all over the world. This data is readily available for anyone to use so my graphs can be reproduced by anyone. The charge by 'the truffle grower' that I used a graph "prepared by Global Warming Art" and that I "altered it to fraudulently bolster his case" is an outright, contemptible lie. I have the entire Greenland oxygen isotope data in my computer and use it extensively to plot data, so why would I use anything else? The data I use has never been altered in any way. "The original suggests that current temperatures are comparable to, perhaps higher than the warmest period of the Holocene, the post-glacial climatic optimum 8000 years ago. Easterbrook's version gives the impression that for most of the last 10,000 years temperature has been warmer than today." This is totally false--below is the Greenland data for the past 10,000 years (Holocene) from the published paper by Cuffy and Clow (1997), two distinguished US scientists. Note that temperatures for almost all of the past 10,000 years have been warmer than present. Oh, and while you're looking at the data, also note all of the temperature ups and downs that occurred thousands of years before modern increase in CO2, most of which were of greater intensity than recent warming. Perhaps the 'truffle grower' should learn to read a graph. According to the 'truffle grower,' "IPCC models predicted 1°F warming from 2000 to 2010. He (Easterbrook) offers this graph to prove that the IPCC was wrong and the globe is cooling." The 'truffle grower' showed only half the graph of comparison of the IPCC prediction (see left hand graphs below). The IPCC prediction is taken as is from their 2000 webpage. The IPCC graph predicted a 1° F increase in global temperature from 2000 to 2010. The point of my comparison is to show that their prediction was nowhere near correct and their models failed miserably in their prediction. If you don't like the green trend line on my graph of RSS , draw your own, but it cannot change the downward trend and the difference in temperature change can only be about 0.05°C. Did the 'truffle grower' happen to notice that the trend is down on his graph? He then shows a plot of a temperatures that conveniently leaves out the 1998 temperature high (which hasn't been exceeded). Shown below is the NCDC trend, which also shows a downward trend. 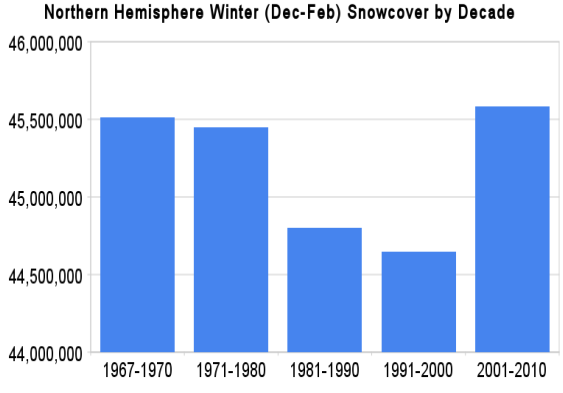 As shown on the graph on the right, the past decade has also broken the record for Northern Hemisphere snow cover, despite the claims of CO2 pushers that snow will become a thing of the past. The 'truffle grower' says "Anybody notice the global cooling induced crop failures in 2009?" Now that you mention it yes--talk to the corn growers in the midwest and they will tell you they have been several weeks late in planting due to the cool weather and they haven't been able to fully harvest their crops because of the cool, wet fall weather. Similar reports on lower harvests have come from Canada, China and India. CONCLUSION -- THE 'FAKE DATA' CHARGE BY THE 'TRUFFLE GROWER' IS A COMPLETE LIE--THE DATA COMES FROM THE WORLD STANDARD OXYGEN ISOTOPE RECORD FROM THE GREENLAND ICE CORES, AND THE RECENT TEMPERATURE DATA IS FROM SATELLITES. ALL OF THIS DATA IS EASILY AVAILABLE FOR ANYONE WHO WANTS TO PLOT THEIR OWN GRAPHS. THE CHARGE THAT THIS DATA HAS BEEN ALTERED IS A DISPICABLE LIE. Prime Minister John Key has been warned he could take a serious credibility hit if he continues to endorse the Latta Review on smacking before he's seen the Investigate magazine article published today. Responding to the PM's comments to NZPA this morning, where Mr Key said the Latta Review had examined "all" the evidence, Investigate editor Ian Wishart said the Prime Minister will probably regret saying that by the end of the day. "That comment's the perfect example of a political knee-jerk reaction - circling the wagons because some advisor has told you it's the best course of action. But John Key has just shot himself in the foot, because CYF and Nigel Latta have both admitted in writing that they did not consider 'all' the evidence at all. "So who's right? Do we believe the Prime Minister when he tells the media his reviewers looked at everything, or do we believe his reviewers when they admit they didn't?" The documents covered in Investigate's special report clearly show the reviewers failed to examine "all the available information", because if they had they could not honestly have published the comments they did. Investigate magazine has blown open the smacking debate by publishing documents that show the review headed by Nigel Latta was effectively a farce, and that parents have indeed been prosecuted just for a light smack. That review, whose findings were announced just before Christmas by Prime Minister John Key and Nigel Latta, claimed to have fully examined cases referred to it by lobby group Family First, and discovered the families had not been “honest” about the events leading up to arrest or CYF intervention. “In all cases”, stated Latta to journalists, there were serious “aggravating features” that the public were unaware of. Latta highlighted those “aggravating features” in his report, but a joint investigation by Family First and Investigate magazine has found Latta’s review got its facts wrong, and based its misleading and defamatory findings simply on police or CYF complaint sheets, not the outcome of court cases after the evidence had actually been tested. The end result: Investigate now has documented proof that ordinary parents have been arrested and prosecuted, ultimately, for simply giving a child a light smack – something both Latta and John Key promised had not happened. For the Prime Minister, the evidence provides a new dilemma – he has previously stated on record that if a parent is prosecuted for a light smack, he will change the law, “it’s as simple as that”. ·	Misdirected itself as to the scope of its review, and as a consequence failed to meet its Terms of Reference. ·	Falsely accused a father of punching his 13 year old daughter in the side of the head and beating her repeatedly with a telephone book, despite a court finding no evidence of such attacks. Full details of the bombshell developments are contained in a 20 page special report in the new issue of Investigate magazine. You’d think, wouldn’t you, that when a Prime Minister as popular and people-savvy as John Key announced an independent review of the controversial anti-smacking law, that National would not be stupid enough to follow in the footsteps of Helengrad. The previous regime was well known for stacking the deck, sweeping things under the carpet and using a corrupt police force to hide its misdemeanours behind. But is it that simple? As you will read in this month’s Investigate, Police and CYF have found a way around the Prime Minister’s promise: collect or invent as much mud as you possibly can about the target parents, and ensure it is placed on the case files, so that the parents can no longer be defined as “good” for the purposes of the promise definition. Nigel Latta, a former critic of the anti-smacking law, was hired by the National Government as an ‘independent’ consultant to join Police Commissioner Howard Broad and CYF/MSD boss Peter Hughes in a special review of the smacking law. Their report was published amid much media fanfare just before Christmas, with the details announced in a joint John Key/Nigel Latta news conference at the Beehive. Any measure of how “good parents” were treated under the Crimes Act would, of necessity, require a whole of case approach from initial report to subsequent conviction or acquittal. How else could you know whether “good parents” were ultimately treated fairly by the system? However, somewhere between being given those terms of reference and delivering his report, Nigel Latta appears to have done a stunningly good impersonation of Pinocchio being led down the garden path by “Honest John” and “Gideon”, in the form of Broad and Hughes. Why do I say that? Because the review team appear to have stitched up their own, entirely different definition of what they were going to investigate. As you’ll see from their excuses responses to our special investigation in this issue, both Latta and CYF now say it was never the intention to measure the severity of the initial police or CYF response against what finally happened in court. Heck no! That would be “outrageous” or “unfair” to CYF and police staff, argue Latta and CYF. No, instead, as far as Broad, Hughes and Latta were concerned, their investigation would look solely at the initial response of the agencies based on the nature of the allegations made to them. The outcome of the cases was deliberately disregarded. If it turned out the evidence didn’t stack up, well, too bad, the public would not find out because the report would say the police and CYF acted “appropriately and proportionately” in the face of serious criminal allegations. Latta went further at his Beehive news conference, and actually boasted to journalists that Family First’s sources were liars, and that he had reached a considered decision after reviewing all the facts on police and CYF files that none of the parents’ complaints stacked up. Ah, the arrogance. Read the story and judge for yourself. Metaphorically, the noses of Broad, Hughes and Latta have now grown long enough to provide nesting space for the complete seagull population of the Wellington City Dump, with space for a few hangers on included. Latta has now told Investigate that minor inconvenient facts, such as parents actually being cleared of committing the serious crimes they were accused of, are “irrelevant” to the integrity of the review. Go back and look at your terms of reference Nigel, then enjoy a Homer Simpson smack to the forehead moment. In our view, the smooth talking bureaucrats who sat beside you took you for a ride. In doing so, the review has scored a massive own goal against its own credibility, and also a massive blow to the credibility of John Key who is now faced with incontrovertible evidence that the smacking law isn’t working, and the growing suspicion that Police and CYF skewered the review in order to cover this up. The book that went to #1 on the climate bestseller list for Amazon US and UK last year has been updated with the latest science, plus full coverage of the Climategate and IPCC scandal fallout. The book is now 20% fatter than it was previously, topping out at nearly 370 pages incl photos. Only available at this stage through Amazon US, or Amazon UK, or other northern hemisphere book retailers, so if you want it in NZ or Oz, you'll need to Amazon it at this stage. "At the moment there are certain rules around Kyoto which just don’t seem to be in the best interests of the New Zealand economy. Because I think when you look at climate change you have to put it in perspective. Yes it’s a global issue, yes NZ could be damaged from a trading perspective if we don’t take it seriously, but equally we want to not only balance our environmental responsibilities but also our economic opportunities, and to simply kneecap our economy and then to leave NZ companies in a much worse position than say other countries, who are also located on the same planet, doesn’t really seem to make sense." John Boscawen has held 19 Public Meetings on the ETS so far, and now more and more New Zealanders are putting pressure on the government to defer it before it is too late. In response to this, Nick Smith and the National M.P.’s are fighting a rear guard action and publishing incorrect and misleading statements in an effort to neutralise the economic logic John Boscawen is presenting at these meetings and through the media. But this is a last-ditch attempt to justify the unreasonable excesses of an ETS regime. Come to one of John Boscawen’s next Public Meetings. Not only will you learn things about the ETS you may not know, join the movement to defer the ETS well armed with the facts, not the mistruths National are peddling. NIWA's David Wratt was the Vice Chair of the UN IPCC's Working Group 1 (WG-1), the prestigious "science" report on climate change. Wratt and others have previously talked of how impeccable the WG-1 process was, so I'd be interested in hearing how he or his colleagues managed to let papers from an unpublished journal slip into the WG-1 report, as part of the growing scandal surrounding the integrity of the UN IPCC documents. So how could 16 papers, accounting for 39 new citations across fours chapters and two working groups, have made it into this twice vetted, next-to-finalized IPCC report? Those citations don't reference research papers the wider scientific community had already digested. They don't even reference papers that were hot off the press. Instead, in 15 of 16 cases, no expert reviewer could possibly have evaluated these papers since they hadn't yet been accepted for publication by the journal itself. Among the 10 papers cited in Chapter 11 three were co-authored by Jens Hesselbjerg Christensen. I'm sure it's sheer coincidence that this gentleman served as one of two coordinating lead authors for that chapter. Is it just me, or does anyone else think that global warming website Watching the Deniers is in a spot of difficulty on this thread (read right through for the context)? I'm not sure whether WTD simply doesn't understand, or whether he understands and simply doesn't want to concede the point...but it's worth grabbing a cup of coffee and a tub of popcorn and sitting back to read. “The madness of the Government’s new carbon tax is that New Zealanders will be the only people in the world paying it. It will drive up the costs of living and undermine the competitiveness of New Zealand business for negligible environmental gain. “Labour Ministers may take pride in being toasted at International Climate conferences for being so bold and brave, but there is no justification for New Zealand going out in the cold by itself on this issue. You told Newstalk ZB’s Larry Williams that you made those comments in regard to a “carbon tax” and therefore that they don’t apply to the ETS. Indeed, the rest of your argument hinges almost entirely on the NZ acting alone issue, and negligible gain. Act has already exposed your legerdemain in trying to equate NZ’s ETS with the much weaker European scheme, as some sort of misguided justification. I don’t care whether you call your July 1 scheme an ETS, a carbon tax or one of Alison Holst’s crockpots...the arguments you made against the carbon tax in 2005 are equally valid against the ETS for exactly the same reasons. Let the public record show your hypocrisy. On July 1st National intends to inflict on New Zealand the world's most comprehensive and expensive emissions trading scheme. It will increase the cost of power and petrol, forcing food prices to rise along with the cost of all other goods and services. Australia has just suspended their scheme until 2013. New Zealand should do the same otherwise we risk an exodus of businesses relocating to Australia to avoid the cost-burden on wealth creators that this scheme will impose. We want this petition to send the Prime Minister the strongest possible message to suspend the ETS. Please support this petition and get everyone else to do so too as the more people who sign, the more powerful our message.